Giving ourselves a little pat on the back: We are proud that you all have made us a leading supplier of high-quality aftermarket Stihl carburetors. Whatever type of carb you need for whatever equipment, we hope you will find it quickly in our Stihl carburetor section. a bulk discount. We even offer dealer pricing for those who qualify. When you shop our store, you'll see that each product has a detailed description. We try to make it easy for everyone to get the right carburetor for their Stihl equipment. At the time of this writing, there are 32 items in the Stihl Carburetor section of our store. We have descriptions for each, and they state what the carb will fit, and what carb make and model it can replace. 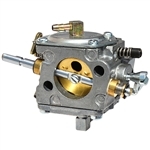 As the leader in supplying small engine carburetors online, HLSupply is uniquely qualified to assist you. In addition to offering complete small engine carburetor assemblies for Stihl equipment, we also offer replacement gaskets and other components. You can repair, overhaul, or completely replace the carburetor in your chainsaw or other tools. Get the part that you need, and get your tools back to work. Our aftermarket Stihl carburetors are high quality, trusted parts. We will ship your Stihl carburetor the day you order it. Buy Stihl carburetor parts from HL Supply - the leader in supplying replacement OPE parts online. Want to Replace a Stihl Carburetor? Dirt, bad gas, and corrosion may have clogged or otherwise wrecked your current one. Get the right parts: Locate your equipment’s model number and serial number, and the carburetor model number (typically stamped onto the carburetor body). By the way, if you need help installing a new Stihl carb or its parts, or if you want to give advice about 'em, join everyone in our OPE Forum. It should take you thirty to forty five minutes, whereas rebuilding one will likely take you over two hours — unless you're the Flash Gordon of small engine mechanics. Since new Stihl carbs cost approximately $20 to $125 (depending upon which one you need), a whole new carb assembly can save you the cost and workload of the cleaning and overhauling of your old one. Add up what two and a half hours of your time is worth, plus parts required to rebuild it. Is that equal to, close to, or greater than the cost of an entirely new carb assembly, plus just a half hour of your time? Then replace it.